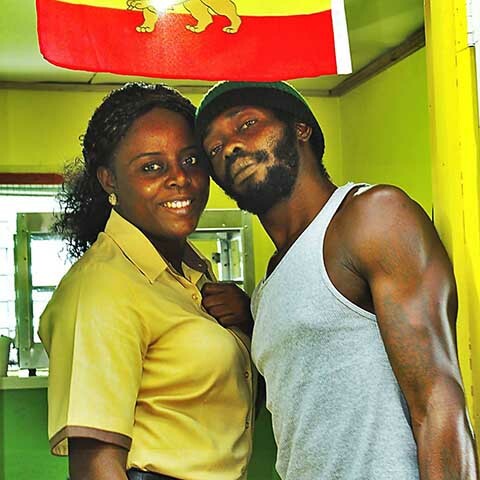 Watisha Browne of Cole Hill and her boyfriend, Dwayne “Fireman” Freeman, of Rawlins have officially been charged with gun possession and possession with cannabis with intent to supply. The couple was charged along with a third person, Natasha Freeman, who also lives in Rawlins Village and is the sister of Dwayne. On the evening of July 8, officers of the Nevis Division and the St. Kitts Nevis Defence Force executed a search warrant on the home of Dwayne, his sister and her two minor children. At the time of the incident, Brown was also on the premises. The police search revealed a large amount of cannabis, amounts enough for “supplying.” Along with the drugs, police also discovered one 9mm pistol and eight rounds of ammunition on the premises. The police then took all occupants of the home in custody and later charged and caution the Freemans and Browne for the offences of possession of firearm, possession of ammunition, smuggling of firearm, possession of cannabis and possession of cannabis with intent to supply. The police report an additional search had them discovering cannabis plants in a nearby plot. The crop was uprooted by officers and will later be destroyed. The Rawlins discovery of the firearm totaled 27 illegal firearms taken off the streets in the federation. Just two days later, however another firearm was discovered in the sister island of St. Kitts. According to a police report, “A subsequent search of a vacant lot in close proximity by the officers and a K-9 team resulted in the discovery of one .357 Revolver and six rounds of ammunition.” The latest discovery now tallies 28 illegal firearms in seven months, eight less than the entire year ending 2016. The Observer spoke with Public Relations Officer Grell Brown on Thursday, who noted that all illegal firearms discovered by the police are turned over to the forensic/ballistic department to check if they were used in the commission of any past gun-related crimes. He noted all firearms taken off the streets are stored in a “secured place.” The guns, he said, after a certain time will be destroyed once all necessary tests are competed. In June, the Team Unity administration sought to impose stiffer penalties for people convicted of gun-related crimes and have substantially increased the penalty for those convicted of gun-related offences. Both government members of Parliament and opposition members of parliament agreed with the stiffer penalties.